Henriques has launched the 50 Express Hard Top model, on its fifteen meter length largest to date platform. This new flagship of the Express Models line up has been designed for the true sport fisherman in mind but also includes luxury accommodations, strong construction, space and style. Alike all Henriques models, the 50 Express Hard Top offers a sizable cockpit area in addition to a molded-in transom door, live well, two large refrigerated fish boxes, boarding steps, tackle prep centers, mezzanine seating, and many other luxuries that contribute to the boating experience. The unique helm area is a pod style design offering Air-Condition, heating, L-shaped seating, three helm chairs and plenty of storage cabinets. 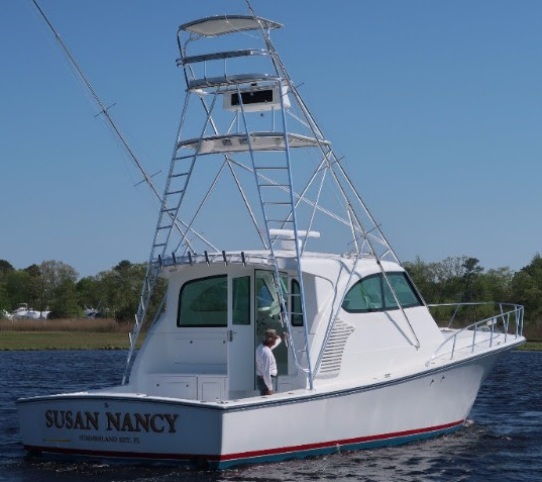 The hand-laid fiberglass hardtop is fully enclosed including the entire aft bulkhead a feature that will extend the fishing season to cold and rainy days. The first 50 Express Hard Top is powered with twin Caterpillar 1050hp which achieve a top speed of 37 knots. The engine room is extremely easy to access through the cockpit area and a Seakeeper 9 had been added to this boat to make the ride more enjoyable and less rolling. The interior layout of the 50 Express Hard Top is crafted to maximize total space. In the galley, there is plenty of room for a cook to feel comfortable with a stainless steel drawer-style refrigerator freezer, stove top, microwave, Corian counter-tops, warm wood teak interior, and ample cabinetry with storage space. The salon offers additional L-shaped seating with a nice size teak table, flat screen TV and custom designed décor. Accommodations include a master stateroom with queen bed and a stateroom with upper and lower bunk.